A disc which traces the emotion and joy of Holy Week and Easter by the most famous of all sixteenth-century composers, Giovanni Perluigi da Palestrina. 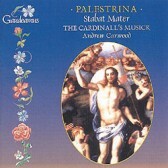 His stunningly moving setting of the Stabat mater is set alongside dramatic descriptions of the resurrection and shows Palestrina to be more emotional and daring a composer than is usually thought. Here also you can see Palestrina using a wariety of styles, from conservative sounding polyphony for men’ voices to vibrant new pieces for double choir where rhythm and dialogue are all important.